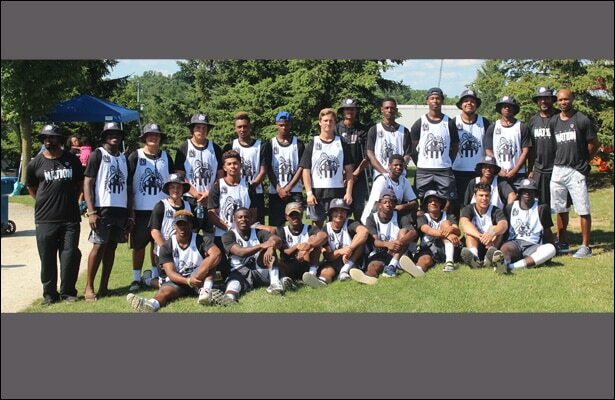 On June 28, 24 high school players from 10 states (including 3 Inside Lacrosse Young Guns and 13 D1 commits) met for the first time at the Adrenaline Summer Invitational PA. They set out to change the game by bringing together elite players from diverse ethnic, socioeconomic and geographic backgrounds to compete at the highest levels. Donning the name Nation United and referring to themselves as “Ambassadors”, the team and attending families brought an enthusiasm rarely seen at summer ball. Their style was fast, creative, and extremely skilled. Despite meeting each other for the first time at the tournament, they played as a team both defensively and offensively. The buzz created around the team brought many players and families to watch their games. Everyone wanted to know more about the team and watch their exciting brand of lacrosse. Coaches Chazz Woodson (Brown, MLL), Troy Kemp (Colgate, McCallie School), and Damien Davis (Princeton, MLL) energized the boys with a fast pace but disciplined strategy. Having players with many specialties, the coaches executed with tactical precision and an eye on keeping up the aggressive pace. The 11 D1 commits and highly recruited players went 4-1 on the week with a staggering plus-8 average goal differential. Sterlyn Ardrey exemplifies the speed on N.U.L. Uncommitted player Cole Zarola (Trinity Pawling) formerly of Westview led the roster of D1 recruits in scoring, racking up 12 goals and 3 hat-tricks. In addition to Zarola, the West was well represented by Nate McPeak (Eastlake), Christian Stallworth (SFC), Hank Ontiveros (SFC), Isaiah Dawson (Bishops), Grant Koopman (SFC), Quentin Buchman (Santa Margarita) and Kalil Scales (Tesoro). According to Nation United, this is just the beginning. The cause-based club will continue the mission of showcasing diversity and growing the game by fielding another elite team this fall. To learn more visit www.nationunitedlc.com. Elite-level players who represent the best of the game, apply here.